Dr. Nwachukwu Charles Uchenna is the Director, Laboratory Services (Food, South West and South East) of the National Agency for Food and Drug Administration and Control (NAFDAC). Dr Nwachukwu joined the Agency in 1994 as a Senior Regulatory Officer and rose to the rank of a Director in 2017. During this transitional period, he worked in different directorate of the Agency. 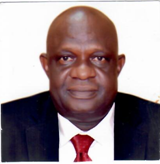 He was the pioneering head of NAFDAC Zonal Laboratory in Agulu. he was instrumental to the nurturing of the laboratory to becoming an ISO 17025 accredited laboratory. He had his B.Sc in Biochemistry from Bendel State University (Now Ambrose Alli University), Ekpoma, Edo State in 1986 and M.Sc in Biochemistry from University of Port Harcourt, Rivers State in 1992. In 2017, he bagged a Ph.D in Pharmaceutical and Medicinal Chemistry with specialty in Natural Product and Medicinal Chemistry from Nnamdi Azikiwe University, Awka, Anambra State. Dr Nwachukwu is a member of several professional bodies amongst which are Nigeria Institute of Food Science and Technology (NIFST), Institute of Public Analyst of Nigeria (IPAN), Institute of Chartered Chemist of Nigeria, Society for Medicinal Plant and Natural Product Research (GA). He has scholarly publication in some local and international scientific journal. He has attended scientific training, workshop, meetings and conferences both within and outside Nigeria. He has been a lead inspector for Good Manufacturing Practice Inspection for Pharmaceutical Products. He had travel to various countries including, United State of America, United Kingdom, Germany, Spain, Hungary, Netherland, India, United Arab Emirate, Brazil, South Africa, China, Zimbabwe, Tanzania, Philippines, Israel, Turkey.